Start thinking about what you wanted to be when you were younger? Teacher, actress, policewoman, mum, did plumber ever come up? I’m guessing that’s a no and the idea didn’t come to Stopcocks Founder Hattie Hasan either, not until her late 20’s. Now the owner of an organisation that actively encourages more women to think about a career in plumbing, Hattie speaks to SHARP about why the industry desperately needs more women and why being a female plumber allows you to join a lucrative and profitable industry. I was a teacher back in the late 1980’s and back then the national curriculum was just starting to come into place, teaching was beginning to feel more like a box checking exercise rather than an actual learning experience and I knew I needed to get out. What I did know is that I wanted to do something with my hands, I had always had a bit of a flare and was always the person to ‘fix things.’ When I was at school I had always wanted to do engineering and metalwork as well as technical drawing and problem solving, but being a girl I was pushed in a different direction. On top of this I also love water and have a great respect for it’s life giving properties, so becoming a plumber felt like a very natural option. So I went to go and re-train and enrolled at my local college. It’s worth mentioning that when I went and I first started learning they had no female plumbing trainees and didn’t even have bathrooms for women, I had to go and use the staff toilets! Also there wasn’t just the gender divide, there was also a North/South divide. I noticed a massive difference between the course in London and the course in Leeds. In London the boys would always ask me out and treat me like a girl, however the Leeds’ trainees were more the ‘and sons’ brigade, where plumbing was what their dad did and they were focused on getting trained up. That suited me down to the ground. I was so focused on getting trained and out into the world. When I first qualified, I became self-employed pretty quickly. It was lonely and of course it was really nerve-wracking. When you go to someone’s house for the first time and you start cutting pipes, even though you’re trained and qualified, you’re always second guessing yourself. 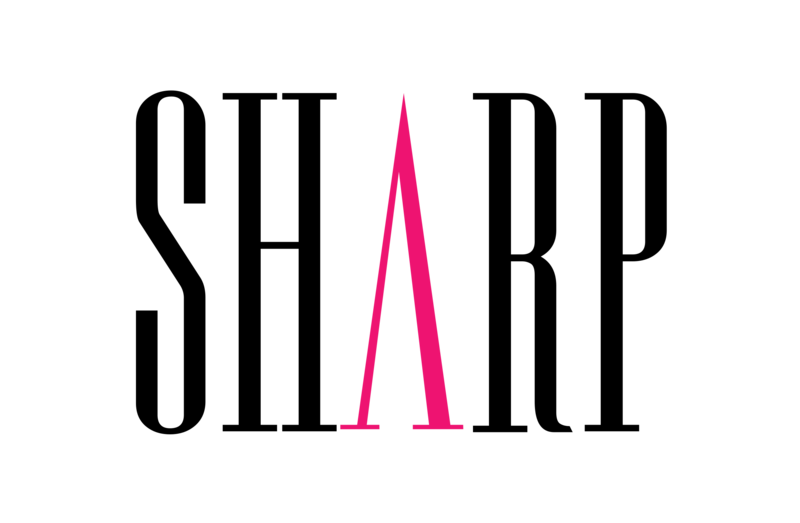 So to combat this I set up Stopcocks in 1990, I wanted to provide an extra level of customer service and respect to our clients that would differentiate us from the market, I also knew there would be other women like me and wanted to create a community where women could rely on each other, and also get industry advice from one another. 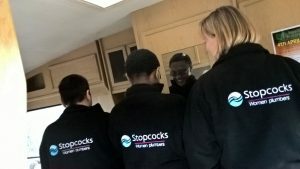 Also I want to make the point that Stopcocks wasn’t just set up to help vunerable older people feel safer in their homes through women plumbers, although that’s something we’re more than happy to do, the overarching goal is to provide an extra level of service that is absolutely beneficial to anyone. We have an awful reputation as plumbers, but there are some really brilliant ones out there. So as a group we already have to work doubly hard to make sure we don’t get tarred with the same brush. We do a number of things to make sure we’re different. As soon as we go onto a job we stop and listen to a customer to hear about the job. But that usually isn’t just about the job, whenever a customer tells us a problem, there are key triggers that we listen for where the customer really tells us how they feel. Yes, the customer may have a dripping tap, but they also haven’t had hot water for weeks and are telling us how absolutely exhausted they are. Listening to their problems is key so you can prioritise and also provide a level of comfort and ease. Our plumbers also turn up on time, which shouldn’t be spoken about as an extra level of service but apparently in our industry it is! There is always a follow-up after the work is complete, we always do a courtesy call just to make sure our customers are happy and to get any feedback on the job. As a plumber you’re fulfilling two roles, that of a hero coming into save the situation and that of a carer. 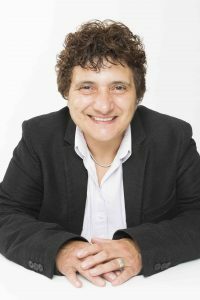 From the beginning we were always quite forward for our industry, we got a website back in 2006, which was practically unheard of for the industry at the time and I vowed that I would do everything I could to build this army of women plumbers. A lot of the time people say that we need to start earlier by going in to schools to talk about female plumbing, but this could be said for every industry. Women aren’t the only ones who are struggling, so are the men. If you’re sending in female plumbers, then we need to be sending in the male ballet dancers to speak to boys too. There are so many benefits to becoming a plumber and becoming self-employed as a female. It’s very lucrative and also very fulfilling as every day you are problem solving and coming home knowing you’ve made a difference to people’s lives. People forget that plumbing isn’t just an emergency service, our plumbers get booked for jobs month in advance to install kitchens and bathrooms or even to work on big jobs such as housing developments or large scale renovations. Better yet, no job is ever the same when you add the element of the individual. There are two types of people. The ones who will have absolutely everything taken out their cupboard and the sink completely cleared who will just let you get on with it, and the other will have a full cupboard, sink full of dishes and will watch you do the full job. But the individual is what makes your day different and that’s what I really love, especially meeting all the different personalities out there. No two days are ever the same, one of the strangest jobs I have ever went on had to be one I did near my Village. A lot of the water is spring water so it runs from the land and goes into a collection tank. I got a call to say the taps weren’t working and after investigating found a huge frog in the hole of the collection tank! Once the little guy was removed the water was miraculously running very well! To anyone considering a career in plumbing I would say absolutely go for it! The support is there, our community is here, and we are absolutely dedicated to encouraging more women into the industry here at Stopcocks. Last year we launched our first conference and to be honest we had no idea if anyone would even show up! But 80 people came and stayed for the entire day, only one person left and she couldn’t stop apologising! It really was a key turning point for us to bring more women into the industry and this year we’re coming back bigger and better and confident we’re going to hit 150 attendees. The event Women Installers Together 2018 will take place on July 4 from 10am-4pm and features a talk from Olympian Marathon Kayaker Anna Hemmings MBE alongside a host of other industry professionals. To attend the even click here.